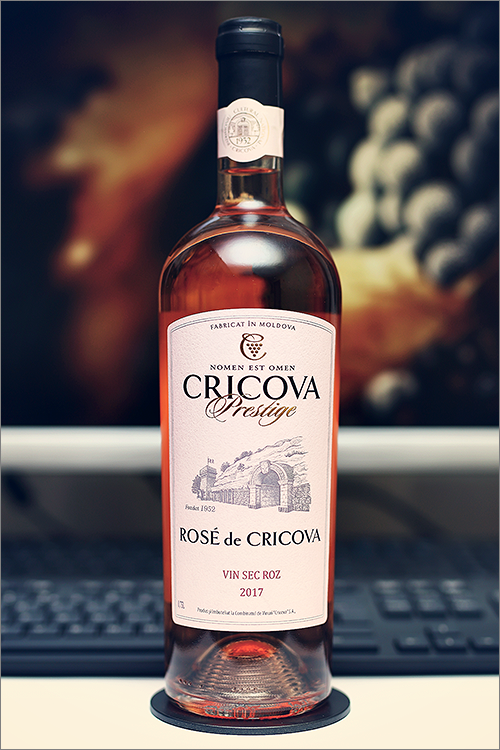 Today we are going to review a rosé wine blend, made of cabernet sauvignon, merlot and syrah grape varieties – Prestige Rosé de Cricova 2017 from Cricova. This wine is part of the ‘Prestige‘ wine series, that is made of wines of premium quality, each one with its own personality and character. The wine is produced using a winemaking process, that is called ‘cryomaceration’, which involves cooling off the must in order to keep the fruity flavors intact, but enough theory, let’s move on to the tasting. Pale salmon color, with onion orange shades towards the rim of the glass. The nose is strong, filled mostly with flavours of sweet berry fruits: berberry, raspberry, red plum, cranberry, red cherry, red apple, iris flower, berberry candy, wolfberry, pink mirabelle, strawberry jam and some subtle hints of red bell pepper. The wine is medium-dry, with moderate alcohol level, high acidity and smooth tannin. This is a fruity, jammy and crisp rosé wine, with a sour-candied profile, as it tastes lean, fresh and bittersweet towards the end. It has a fair overall balance and it feels round and rich – a rosé wine that would never disappoint. The wine has a medium-plus finish and a balanced, a bit sour aftertaste. Conclusion: this is a wine that is quite close to its prime form – rich, expressive and delicious, maybe just a bit opulent, with some fizzy hints towards the end. It is not clear if ageing is an option for this wine, as we cannot distinguish any age-worthy signs, therefore our recommendation is to drink it now, as long it is still young and beautiful. As we often like to mention – it is always better to drink a wine a year too soon than a day too late, which is valid for this wine as well. In order to enhance the wine’s aromatics at its best, pair it with some strawberry panna cotta or, why not, a strawberry cream shortbread, as the later one is an epic pairing indeed. Cheers!